Why we believe Technology partner should be a team rather than an Individual? Mobile Innovations have accelerated the change in relationship between IT and users. Way2Smile Solutions Card2Contact App brings back business card in a big new way! Web and Mobile Enterprise Apps fuel operational efficiency and increase engagement with your customers! Traditional development approach will fail for mobile apps.Our approach is quite different! How you can leverage social media to promote your app ? TiECON is BACK! Join us in TiECON on October 31st and November 1st ‘14! Tools to increase your Team's Productivity. W2S Solutions has recently launched a mobile app to help enterprises to manage their expenses effectively. SaaS based Enterprise web application – good or bad? Why SSL certificate is important for an enterprise Web app? How to hire a Chief Technology Officer for your business? How to avoid security breach in your WordPress website? Why iPhone and iPad app Development Is So Popular? Why is branding important for a business? What's the best Mobile Strategy for large Enterprises ? Which App Development Platform Is Right For Your Business? What Tricks Make a Mobile App Addictive? What are some things to take into consideration when building large web apps to prevent hassles in the future? What are the best ideas for web apps that haven’t been made yet? How to become a Billionaire by building a great Mobile app? Invoice Templates or Online Invoicing Software: Which Is Better? How to Validate your Mobile App Idea? How A Live Tracking App Empowers Employees? How to Get Paid Faster as a Freelancer? Why should you Choose W2S Solutions for your App Development Needs? How Automating Your Billing Will Help Your Business Thrive? How to Boost Your App’s User Retention Rates? How Long Does It Take to Develop a Mobile App? How can I issue GST invoices manually? Why A Prototype Can Ensure A Successful Start Of An App Development? Why Developers Have Switched To Kotlin Programming Language for Building Android Apps? Website Redesign: How to Create Meaningful CTAs? What Mobile App Developers Need to Know About Blockchain? Why Is Web Application Development Important for Enterprises? Will Progressive Web Apps impact your SEO strategy? How much does it cost to build a Custom Web Application? Custom Web App or Off-the Shelf App - Which is Your Choice? Why Should You Choose AGILE for Mobile App Development? How India Developed as a Mobile App Market? Why not having a business app can be Fatal for your Startup? How Blockchain Technology Will Revolutionize Mobile App Economy? What Happens When Machine Learning And DevOps Join Hands? How Artificial Intelligence is Driving Mobile App Personalization? React Native — Is it Really the Future of Mobile App Development? Android vs iOS User Behavior: How Does It Impact Mobile App Development? How Trail Tracking Apps Helps User To Enjoy The Trails? Industry 4.0: The Greatest Phenomenon of the Millennial Generation and what it could mean to them? Why W2S Solutions is Good in Building Location Based Apps? How To Build A Complex Map Based App With LeafletJS? Why should you follow the top UI trends and redesign mobile apps in 2019? Google maps is a paid service. What are the alternatives? What are the challenges and advantages of location-based applications? Why iOS developers should pay attention to Flutter in 2019? A precise estimate of the cost to develop an iOS mobile app? MVP or EVP: What is the Right Option for Your Startup? How are mobile application design and development services going in Dubai, UAE? Why Are Android Launchers Becoming Less Popular? Why entrepreneurs need on-demand delivery apps? Xamarin is currently owned by Microsoft. 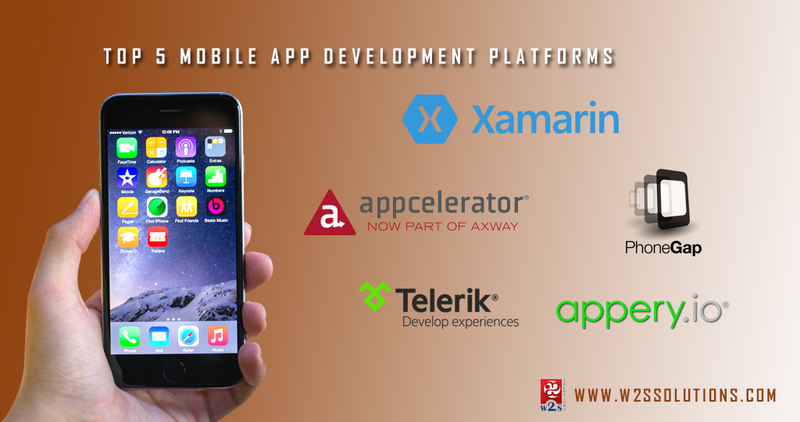 It is ideal for cross-platform development and you can test your app and monitor it as well. It works on multiple platforms including Windows Store, Android, Amazon, Windows Phone, iOS and others. You do not have to know a variety of programming languages in order to work with it. For mobile apps, you are able to use jQuery,ionic mobile, which contains a variety of instant configuration codes and styles. Within one month, you are able to design application and deploy them along a variety of platforms. 4. Telerik – This application is standards-based and gives people the option of building apps for devices that include desktops, tablets and mobile, and you are able to use any approach. This platform has capacity for businesses to carry out web, local and hybrid development. Additionally, one is able to use the cloud, which quickens the development process and provides app support. 5. Appery.io – This is an app builder for mobile devices that is cloud based. You can create applications for Windows, iOS and Android. This app builder is made to run using cloud technology and you are not expected to download or install anything. It is possible to use the various available plugins to add functionality, or you can create custom plugins that you can use in the various apps you create. Though these frameworks usually evolve, leading mobile app development companies should be able to recommend the framework for your requirement. Its advisable to find their track records in these framework before initiating your app project with them. Madhu Kesavan likes to do things in a better way. More than a decade of IT experience and 5+ years of Entrepreneurial journey, He knows its great to start a business, but its lifetime challenge to run successfully. As a CEO of W2S solutions, He leads a team, motivate them, mentor and help them to succeed. Whatever stage your business is, Madhu Kesavan will help in analyzing your business and provide an IT strategy. His experience, openness to new approaches, familiarity with various technologies helps his customers to achieve their vision. Now a days mobile apps are very important to support the website of small business. And its very difficult to choose the correct platform to develop it. This article gives good idea to choose the best platform. Thanks for sharing.